The time was fall of 1969. The place was Ann Arbor, Michigan, in the northern United States. Ann Arbor is a college town. The feeling of excitement was in the air. Woodstock happened just two weeks ago, on August 18, 1969. The Vietnam War was at its peak. The catch-phrase of the day was tune in, turn on, and drop out. That is pretty much what we did. Collectively, the youth thought we had a better way. We certainly were not in turn with what was happening in Vietnam. It was as though the war affirmed our reckless behavior. Timothy Leary became sort of a spokesman for my generation. New drugs appeared for the first time. He called them mind expanding. We believed him. Earlier that year, I had tried one at a party. The term mind blowing is not an exaggeration. This was not subtle, like alcohol. On the contrary, after about a hour apparitions started to appear. Reality began to split and multiply. As it did, it became more complicated. As it became more complicated, the apparitions multiplied in number. There was no way out. Then, all of a sudden, I had this idea. From chaos came clarity. I wanted to write the idea down but I didn't have a pencil and paper. I remember thinking, in my mind that I couldn't get back to where I was. Not physically but mentally. As soon as I had the idea, it was gone. That was about three months ago. I learned something important but I didn't remember what it was. It isn't easy to stay focused when you are 18 and these drugs are in the environment. Mind altering experiences like this make it seem whatever you are doing is a lot less important. School, jobs, and life's necessities didn't seem that important. That isn't good. At 18 you need to compete for your piece of the pie. Instead I did the opposite. I tuned in, turned on, and dropped out. Fall in Michigan can be beautiful. There is a period during the year when the days shorten but are still warm. The leaves on the trees turn yellow, red, and orange. The mosquitos are long gone. Fall is that brief period where the weather is really good. Students return to classes. The impending winter makes fall seem all the sweeter. It was during this time when the party happened. It was one of those parties that turned into the party of the year. Everything just fell into place. Someone was able to score an apartment for the evening. I don't even think it had furniture. The mix of people was just right, not too many and not too few. There was a mix of friends and strangers. It was one of those magical nights when everything just worked out perfectly. We were college age. Anyone aware of the college atmosphere of the early 1970s knows what I'm talking about. The culture of hippies, Woodstock, and peace was in full bloom. Someone, I don't remember who, had a line on something special for the party. Most of us took one. This was not anything unusual for my culture. It was late teens and early twenty year olds coming together to get high for one special evening. We were free of parental supervision. We were college-aged kids in a college town. As the party began no one felt anything extraordinary. It was just young people sitting in an apartment talking in small groups. As the party got going I remember thinking to myself how loud the conversations were. As the party developed there was cloud of love that engulfed the group. The closeness everyone felt was hard to describe. There was no shyness. There was no searching for conversation. On the contrary, people were emoting loudly in little groups. You could feel the closeness. It was palpable. After about an hour the drug began to take hold. Unlike the first time, this was far more subdued. Most people didn't feel anything at all except the heightened closeness with others in the room. What I noticed is that the conversations became louder. Not necessarily louder in terms of volume. They were louder in terms of the attention they demanded. They were more insistent on being heard, if you will. Ever the problem solver, I wondered what was causing this effect. As the night went on, I began to realize that I was hearing more than I normally would. Whereas before while sober, I would hear one conversation. There we times during the evening I was hearing more than one. The sensation isn't what you think. It wasn't as though it was anything useful, like playing piano (with both hands). It was confusion. The manifestation of hearing more than one conversation was an increase of confusion. It was not pleasant. Out of this crucible of confusion came the first theory, Proof of Afterlife By Awareness. What I saw, first hand, was that during life we listen to far less than what I was experiencing now. That single experience opened me up to the idea that life doesn't end at death. In fact it does the opposite. It blows up. I remember sitting in the room, watching everyone had pared off into small groups. Within each small group was a conversation of intense interest. The people in the group were in rapt attention with their group members. They may have been ten or more groups in the room. I was struck with the thought that there are ten conversations in the environment, yet we hear only one. At that time it was abundantly clear there is far more going on than we are aware of. What I was shown that evening was a little key. The key was that my mind was in confusion. Normally, when in a room full of conversations, you tune into one and tune the others out. You are relaxed, controlled, and at ease. That evening I had no ability to tune the other conversations out. They were all equally important. The result was confusion. I was not relaxed, controlled, nor at ease. To most people that evening this meant nothing. They were in party mode. Heightened awareness was no big deal. But to me it was a big deal. This seemingly insignificant opening of awareness held the key to the afterlife. It proved afterlife. Now, fifty years later, I will show you exactly how it does prove afterlife. Here is the first proof, Proof of Afterlife By Awareness. Awareness, within the context of this discussion, is the ability to perceive, to feel, and be conscious. Awareness is the state or quality of being aware of something. Awareness is being alive. Awareness is our perception and cognitive reaction to objects, conditions or events in our environment. It is being aware of our surrounding environment. It is our focus. It is our consciousness. It is that portion of what is going on around us of which we are consciously aware. It is what our conscious mind focuses on. Someone is aware when they focus on what is happening around them. Awareness is being alive and mindful of what is going on in your surroundings. The period of time from 10:00 to 10:04 was rather hectic. Looking back on it we have a tendency to think that everything happened at once. In our minds, we think that we got hit with four things at once. However when you draw it out on a time line you can see that four things did not happen at once. They happened over time sequentially. At 10:00 you are sitting at your desk. Someone walks by and says hi. Your attention (shown as a black dot) shifts from whatever you are doing to the person. 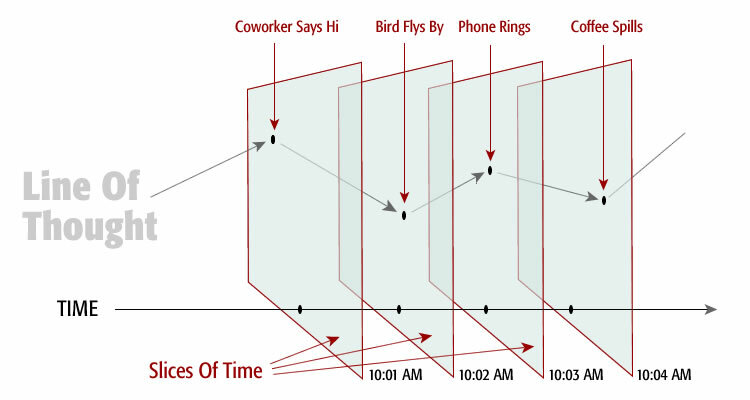 At 10:01 when the bird flies by your attention shifts from the person to the bird outside. Then it shifts again. Finally it shifts again to the spilled coffee on the desk. Because awareness is sequential, we tend to overestimate what we are aware of. What feels like four things happening at once is really four individual things happening over time. During any given moment there is just one thing we pay attention to. Hence, our awareness behaves as a focal point within the environment. This is shown above as the black dot above shifting focus in the environment over time. It darts around from one thing to another thing continuously. We tend to focus exclusively on the one thing we deem important at the moment. Then focus shifts as our attention gets preempted by something more important. We think we have paid attention to all four things simultaneously. However we really focused on just one thing at a time. Imagine twenty people in a fairly small room like this. 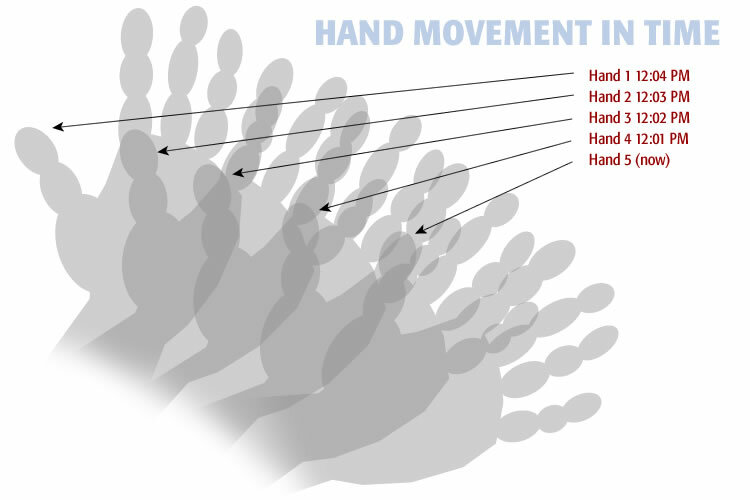 People are formed into small groups as shown above. 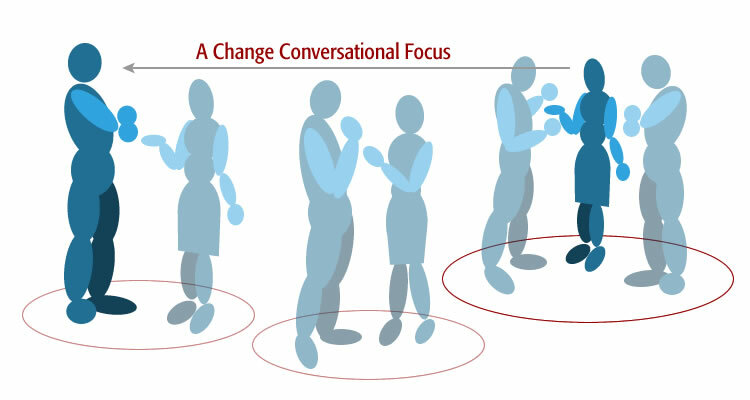 Inside each group is a conversation as represented by the red circle surrounding each group.. People are standing around, affiliated with their group, listening and commenting on the current conversational topic of the group. Each group maintains its own unique line of thought. We walk around the party alone, not affiliated with any particular group. When we join a group our awareness focuses on the conversation of the group. We listen to the conversation of our group, focus on it exclusively, and tune out all the other conversations going on simultaneously in the groups around the room. 1. The blue dots represent people at the party. 2. The red circles represent the conversations of the various groups of people at the party. 3. The lighter green circles represent the range of the sound (noise) generated by the conversations of the groups. When we join a group (shown as a blue dot within a red circle) we listen to the conversation of our group. However, the sound of our group's conversion (as represented by the shaded green circle) extends physically beyond our group. The sound of conversation (light green circle) is much larger than the group (red circle). Our ability to listen to the conversation in our group (and tune out all the other conversations in the room) is not based on proximity. Nor is it based on sound volume. The conversation we pay attention to is based on awareness. We are aware of (tuned in to) the conversation in our group because we choose to focus on that conversation. At the same time we choose NOT to be aware of (ignore) all other conversations. Other conversations become background noise. We tune them out. Of all the conversations in the room, we listen to only one; our immediate group's conversation. The other conversations are relegated to background noise. They may be just as loud as the conversation we are listening to, but we choose not to listen. We can hear other conversations (as shown by the overlapping green circles) but we do not listen to them. At some spots in the room we hear three or more conversations. Yet we choose to listen to the one we are in. Our conscious awareness stays with one conversation only, usually the one we are actively engaged in. 1. Imagine being in a group listening to its conversation. 2. Then, all of a sudden, you unintentionally catch an interesting piece of gossip in the group next to you. 3. You are really interested in this gossip so you tune out (ignore) the group you are in and tune into the group next to you. 4. You hear the tasty piece of gossip from the distant group. You listen exclusively to what they are saying for a little while. 5. Then someone in your group asks you a question and your attention comes back to the group you are in. There is nothing to stop us from doing this. Attention shift happens all the time. All we have to do is to shift our awareness from our group to another group and follow their line of thought. We do not need to move physically. All we need to do is change our focus. When our awareness is in another group's conversation we will lose the line of thought in our own group's conversation. While your attention is with the other group, our group's conversation becomes background noise. The woman in the back right of the room is interested in the man on the far left. She quits paying attention to the conversation of her immediate group and focuses her attention on the man's group across the room. Now she listens to their conversation. Consequently she tunes out both her conversation and the conversation in the middle of the room. She can do this because focus is based on attention, not proximity or volume. While a shift in focus like this is possible, ignoring the people in your group is not good manners. So as soon as someone in her group speaks to her directly her focus will quickly return to her group and pick up the thread of the conversation we she left off. It is important to realize that her focus can be in her group or it can be across the room but it cannot be in both places at exactly the same time. 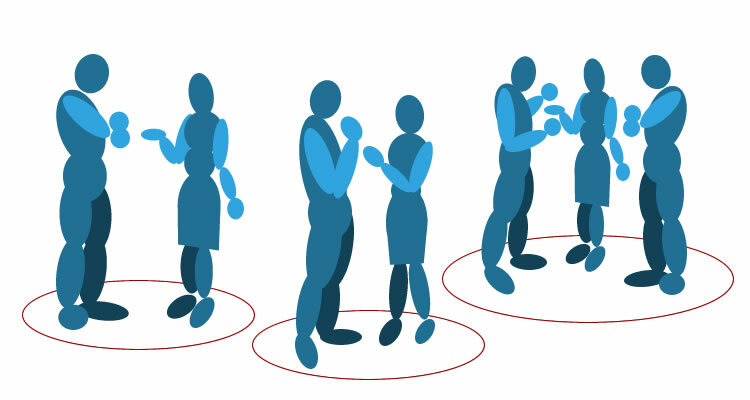 We can simulate focus in two places in the room by darting back and forth between conversations. Shifting focus like this is like the worker, bird, phone, coffee analogy above. What appears to happen simultaneously actually happened over time. Our attention may dart between groups quickly, but at any one moment our focus is with just one group's conversation. The left side of the diagram shows all the conversations going on in the room that are loud enough to hear, but have chosen to ignore. The right side of the diagram shows the one conversation we are paying attention to currently. There is a one (conversation we actively listen to) to many (all comversions in the room) relationship going on. 1. On the left side, we have the total environment represented by all the conversations in the room. 2. On the right side, we have the one conversation we are currently engaged in and listening to. In conclusion, we are not aware of all the conversations around us at any one time. The sequential nature of awareness (darting about the environment over time) leads us to believe we are aware of more conversations than we actually are. As the party analogy shows, at any one moment in time, we are aware of just one conversation. This is but a small portion of all the conversations we hear. To understanding awareness look at just one moment in time. Awareness moves around quickly. It can dart around from thing to thing in the environment. Because awareness moves around quickly we tend to think that it is in two places at once. What is really happening is that awareness concentrates on one thing, then moves quickly to another, and the back to the original thing. This makes awareness seem as though it is in two places at once. It makes it appear bigger than it actually is. For a clearer view of awareness we have to narrow our frame of reference down to one moment in time. In a geometric sense this is just one slice of time. When you look at the single moment in time, you eliminate everything outside that moment. What happens just before and just after that moment is out of the picture. Listening to two conversations at the same moment is entirely different than darting between two conversations over time. Listening to two conversations at the same time would feel like having two people shouting at you, each demanding your undivided attention. It would feel like each person yelling into each ear. It would be beyond annoying. It would be hopelessly complicated. It would be completely intolerable. Awareness is not set up to be in two places at the same time. When it is, caios ensues. When we walk into a room, our awareness darts about looking at the floor, the walls, and the people. By moving our focus throughout the environment, we quickly gain an understanding of what is going on. However in any one moment, we are focused on just one aspect. A fundamental quality of awareness is singularity of focus within a moment of time. At the party we are listening to one conversation while 12 other conversations are going on at the same time. Those ignored conversations are considered background noise. 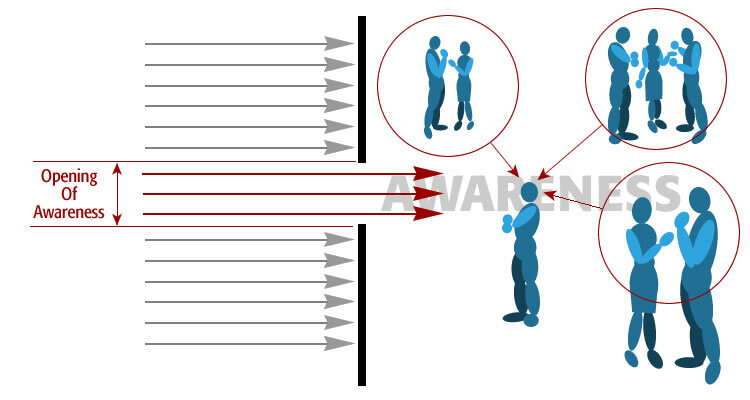 The illustration below shows the conversations in the room as arrows approaching our consciousness. 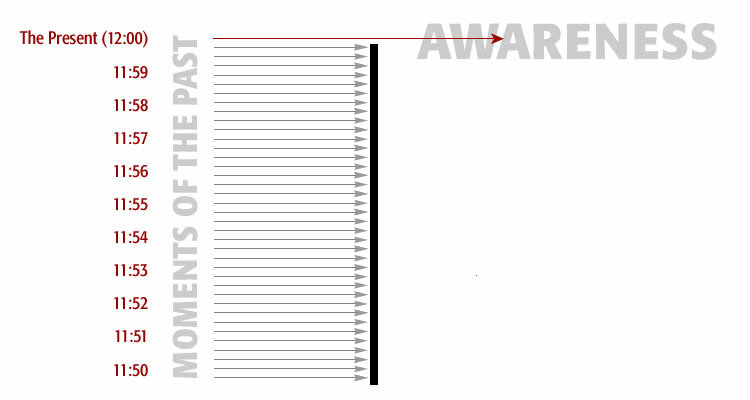 The heavy black vertical line represents the current moment. The black line represents conversations are reaching our ears. We hear all of them all. We know we hear them because all we need to do is stop a moment, change our focus to any one of them, and will be able to listen to the conversational thread. Their sound is reaching our ear drums. When represented as a diagram like this, it becomes clear there is much more going on in the environment than we are aware of. We actively listen to one conversational thread. Meanwhile the other conversational threads that are hitting our ear drums are relegated to the background. Imagine going back in time to relive this exact same moment. The second time you experience the moment however, you change your focus to a different conversation. This time you have is the exact same environment, with awareness focused on a different conversation. The first time we experienced the moment we were listening to conversation A. The second time we were listening to conversation B. The two environments were identical. The only difference is what we were aware of within the moment. Whether we were listening to conversation A, or conversation B, is a matter of choice. It points out that there is more going on in the environment than we are aware of. This becomes especially clear when you look at one moment in time. The next step is to examine the ratio between awareness and the environment. Awareness is less than the environment, that much we know. How much less needs to be determined. Are we aware of half our environment? Are we aware of one quarter of our environment? What is the mathematical relationship between our awareness and our environment? 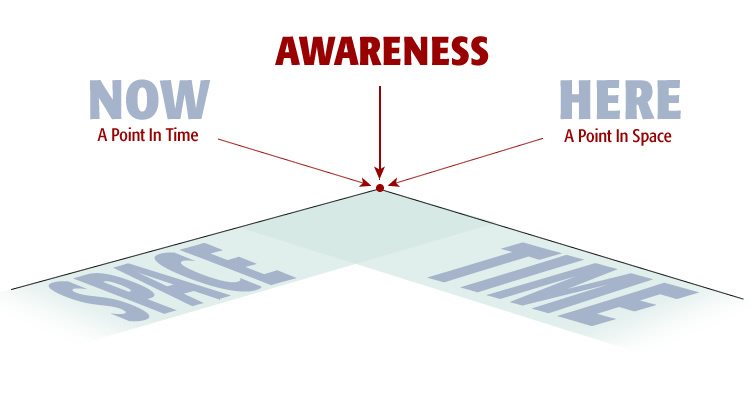 The illustration shows three conversations getting through to awareness simultaneously, instead of just one. Three simultaneous conversations are shown as three arrows in red on the left. Normally just one conversation gets through. We listen to just one at a time. 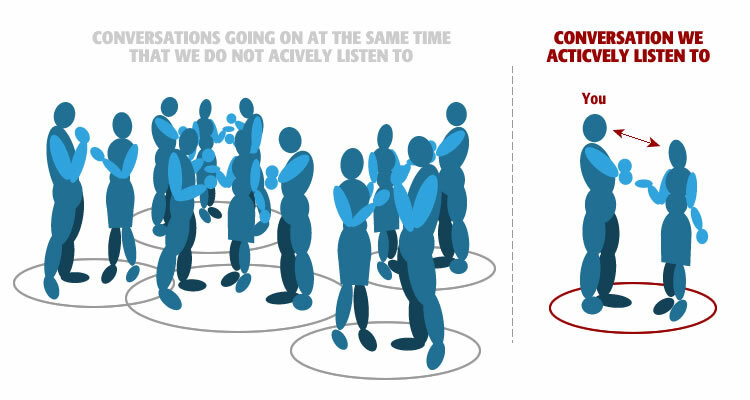 Now, instead of listening to one conversation, we are actively listening to three as shown by the groups on the right. 1. You can eliminate any jumping back and forth between groups because this takes time. We are talking about a moment in time. 2. Each conversation would be attacking our conscious mind with the same intent and focus as we previously had with just one. Rather than listening to one and hearing three, we are talking about listening actively to all three simultaneously. 3. If asked to take an exam on the subject matter of each conversational thread we could pass it. The result of listening to three conversations would be complicated, chaotic and confusing. It would be as though three different groups were shouting at you demanding to be heard exclusively. Without the ability to hold back the other two conversations, we would decend into madness within seconds. In the thought experiment above we opened our awareness from one conversation to three. As a result we were plunged into chaos and confusion. Opening awareness even this tiny amount resulted in a drowning of stimulous. Undaunted however, we are going to open awareness still further. We are going to force awareness to accept (be aware of) even more of the environment. Imagine opening awareness from three conversations to six. Now we have six arrows in red. Imagine opening awareness up still further. Imagine being able to actively listen to and fully understand every conversion in the room all at once. Imagine how confusing that would be. What is the upper limit of awareness? The answer is, the upper limit of awareness is the environment. The illustration above, awareness in time, looks like the conversations in the room. Awareness operates in time exactly like it operates in the environment. In the environment we are aware of one conversation at a time. In time we are aware of one moment in time. We are not aware of multiple moments of the past. We are aware of the present only. Awareness is focused in the present moment. Awareness is located at one moment at a time. What would it feel like to experience three moments in time simultaneously? The diagram above shows the utter confusion ensuing from being aware of multiple moments simultaneously. Showing awareness expanding in time is even clearer than showing awareness expanding in space. You can see that if had were forced into this five moments reality, your environent would become unbelievealby complicated. Faced with these complications, would decend into madness in seconds. What is the upper limit of awareness with respect to time? The answer is all time, every moment you have ever experienced. This includes all moments in time from the time your life began at conception up to, and including, the present. On the left side of the equation we have the ratio between awareness and life. Awareness, during life, is in the present. The upper limit of awareness is a lifetime, from conception to now. On the right side of the equation is their geometric equivalents. On top, we have a moment, a single point in time. This is analgous to the present. On the bottom we have an eternity. An eternity is all time. The replationship between the present (awareness) and a lifetime is exactly the same as their geometic equivalents, a moment in time verses an eternity. On top of the equation (the numerator) is what awareness is during life. On the bottom of the equation is the upper limits of awareness (the denominator). This represents what awareness could potentially become. The left side of the equation shows the relationship between awareness within the environment. During life awareness is a point of view within the environment. The right side of the equation shows the geometric equivalents. On top we have a point. This is analgous to conscious awareness. On the bottom we have space. This is analgous to the surrounding environment. The relationship between point of view (awareness) and the environment is exactly the same as their geometric equivalents, a point in space versus all space. On the top (the numerator) we have what awareness is during life. On the bottom of the equation is the upper lmits of awareness (the denominator). This represents what awareness could eventually become. Now that we have been through our thought experiments, we are going to solve for awareness in the time/space continuum. To solve this equation we apply the relationship between awareness and time, as well as the relationship between awareness and space. 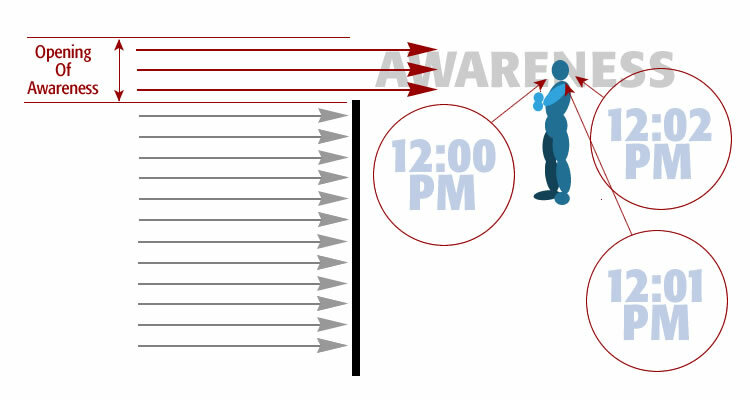 This diagram shows awareness as a point in time and space. We can envision awareness being located at a specific point in time, and a specific point in space. Awareness can be thought of as a single point in a time/space continuum. 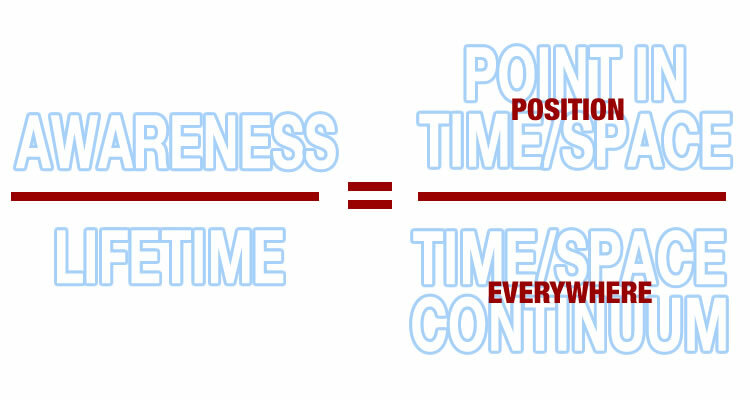 The left side of the equation shows the relationship between awareness and a lifetime. On top, we have awareness as a point of view with time and space. On the bottom, is all the enviroments of an entire lifetime. On the top right we have the geometric equivalents. On the top, we have a single point in time and space. It has position ohly. On the bottom, we have a time-space continuum. This is the unlimited length, width, depth, and time surrounding the point. On the top (the numerator) we have what awareness is during life. On the bottom of the equation is the upper limit of what awareness could become. You're sitting in a room surrounded by five conversations. You listen to one. You hear the other four. You only paid attention to one. The other four you ignored. You heard all five conversations. They entered your ears and were absorbed by the mind. Yet you were only aware of one. The question becomes, what happens to the other four? All five conversations are retained. In the moment, we deemed one relevant and others irrelevant, however all were retained. The information that passes into memory unnoticed far exceeds that which is noticed. The relationship between unnoticed-to-noticed is one to many. Expressed geometrically, it is space-to-point. Gathering unnoticed information, over a lifetime, represents a huge unrealized potential. You could argue that this huge unrealized potential is discarded at the end of life but you'd be wrong. Everything in life, realized or not, is retained in the mind. If all is retained, then what happens to this huge unrealized potential? The answer is it is realized in a single moment at the end of life. Here is a diagram of two boxes. There is a small box and a big box. 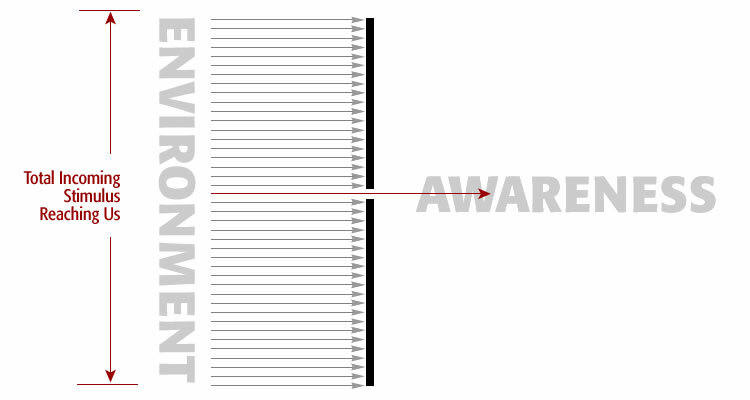 The center of each box is located at the center of the environment. In other words, both are placed in the environment at location 0,0,0. 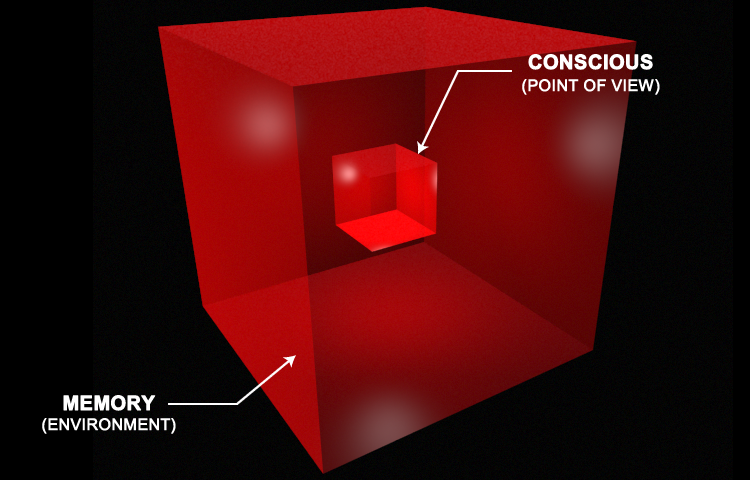 The inner box represents conscious awareness. It can be thought of as a point of view. The outer box represents memory. The centers of both boxes are at the same location, which is the center of the environment. The mental image is to make the inner box smaller, while making the outer box larger. Push the inner box to its smallest possible dimension. That would be a single point at the center of the environment. Push the outer box correspondingly larger. That would be the environment itself. There you have it. The point at the center of the environment is awareness. The environment itself is memory. The important thing to realise is that the human mind contains iboth boxes. Life is not only conscious awareness at the center. It is awareness surrounded by memory. In terms of untapped potential, during life we are like a tiny minnow. We takes tiny bites of information as we swim through life. Meanwhile, in the background and complete unbeknown to use, memory is like a mega-mouth shark. It scoops up huge amounts of information as it swims through life. Memory's mouth is wide open. During life we are the minnow. We are also the large shark. We just don't realize it. The massive food eating of the large shark takes place in the background. It goes on unnoticed. During life the little mind is in control. Awareness is not allowed to expand during life. If it trys, it drowns in confusion. It is confined to position. At the end of life, when the little mind no longer exists, the big mind still exists. The big mind is our unrealized potential. Basically, it contains everything. The manifestation of the big mind taking over is awareness exploding throughout space. In the previous section we spoke about the duality of the human mind. On the one hand, it is the focal point at the center of the environment. We call that the little mind. On the other hand, it is the surrounding environment. We call that the big mind. The mind is both, with little mind contained inside the big mind. There is also a third mind. We have the little mind, the big mind, and the super big mind. The super big mind is time. It works like this. As we move through life, we experience moments. In the moment we are the little mind. We also are the big mind. Both minds get absorbed into memory. Hence memory becomes the third mind. We have awareness, contained in the environment. We also have the environment, contained in memory. We have a container, inside a container, inside a container. During life we are the point in the center of our environment, on the leading edge of our time-space continuum. Awareness is shown as the small red dot in the center of space. Awareness is a single location in time-space. It has no length, width, depth, or duration but it exists. At the moment life ends, the little mind ceases to exist. At this moment the mega mind takes over. This is manifested as awareness exploding throughout time-space. 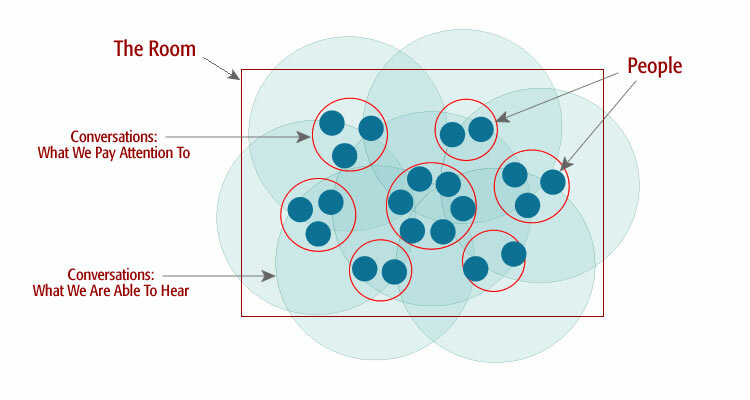 The illustration shows expanding boxes representing awareness expanding outward from its central location. 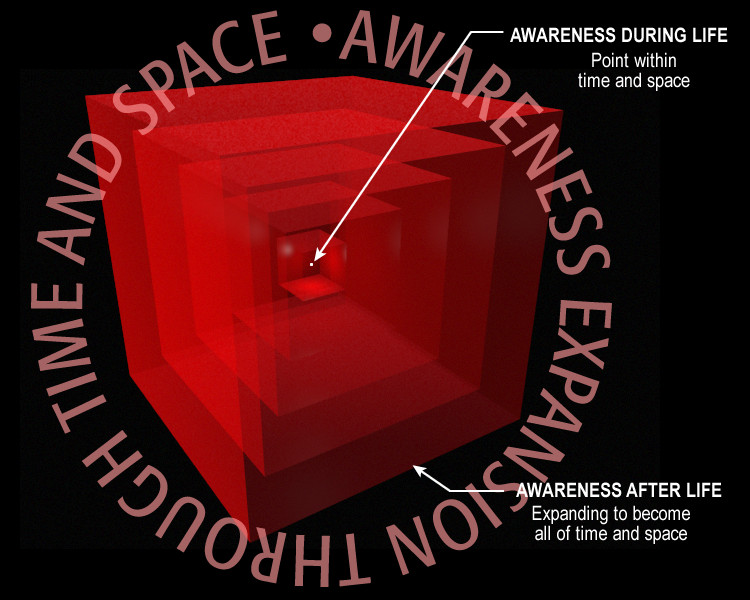 The concentric boxes represent awareness expanding into time-space. 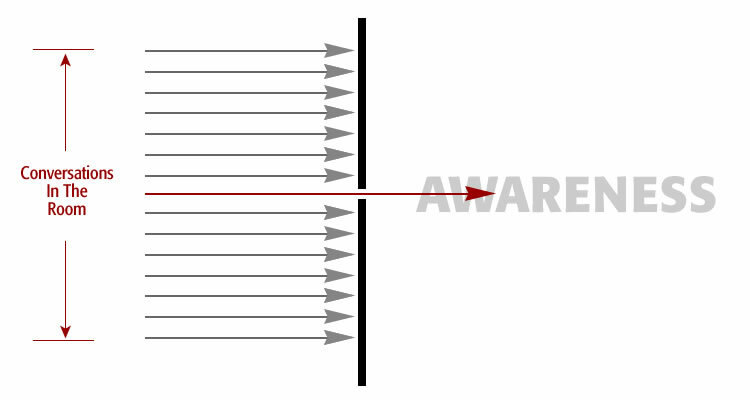 In the drawing, awareness goes from one unit to two units. Then it goes from two units to four. Then it goes from four units to eight. Finally awareness expands out to its fullest extent absorbing all of time-space. Understanding afterlife requires thinking in geometric terms. Geometrically you have a point in time-space becoming all of time-space. This is the same dimension change that occurred at birth. Afterlife is awareness undergoing a dimensional change to become everything. Afterlife comes down to unrealized potential. Consider awareness as a location within time-space. Consider time-space as surrounding awareness. Awareness and surrounding time-space how we live life. During life everything we experience is being filed away in memory. Memory is all inclusive. It contains everything. Absorbing all information into memory and retaining it, as opposed to discarding it, sets up a huge reservoir of untapped potential. That untapped potential is the time-space. It is saved during a lifetime. Memory containing time-space represents afterlife. It is the kingdom of heaven. Awareness, at the end of life, expands to absorb all information you gathered throughout your lifetime. The moment life ends, awareness goes from a point in time-space to all time-space. Afterlife is as an explosion of awareness throughout time-space. Through afterlife we become everything. This is physically possible because when the human body stops functioning we are in the presence of everything. Everything is contained within memory. The moment life ends, everything is with us. Memory is all inclusive. All our experiences are with us in memory. Everyone we have ever known is with us in memory. Everything we have ever done, every thought we have ever had, and every emotion felt is with us now. It is with us at the end of life. Our life will end at a specific point in time-space. When it does however, that one point expands to become all time-space. Yes, afterlife is only one moment in durantion. But that is from the perspective of an outside observer. The person inside afterlife is experiencing all time-space simultaneously. You can think of it as a moment expanding to become an eternity. You can think of it as a point expanding to become a universe. For afterlife we only need this single point in time-space. That single moment-point transitions to become everything. Because afterlife is just one moment in duraction it is independent of the physical body. Afterlife is as all moments of life experienced completely, simultaneously, and eternally. I run a server on the Internet. My server has a fixed IP. That means it has a fixed location on the Internet. The IP address does not change, as do most Internet connections. It remains fixed, on the same IP address, all the time. IP addresses are numbers. Each one is assigned to a computer. Each one is unique. There are 999,999,999,999 IP unique addresses. We are running out of them. There are a lot of computers on the Internet. Every one of these computers can reach my computer. They have direct access to my computer. Unfortunately not all these people have good intentions. Many of these people are trying to break in. Being exposed to attack is just part of the business. The attacks come nonstop. They come from all directions. They are constantly probing for a way in. To combat these attacks, those of us hosting servers, use a firewall. A firewall is in separate hardware device. It sits between our server and the Internet at large. Traffic attempting to reach my computer goes through the firewall first. If the firewall deems the request for entry acceptable, it forwards the request to the computer. Here's what it looks like when the firewall goes down and users are allowed to directly attack the computer. Computers have ports. A port is actually a memory address. I like to think of a port as a hole. A computer has 65535 ports. A computer has 65535 holes, any one of which can be used in an attack. So you have billions of computers able to attack your computer using any of the 65535 holes. What a firewall does is close down holes. The security concept is to close everything, then open only those ports that have activity on them. When you visit a web site for example, you contact the server using port 80. Since the hosting web server is actively listening on port 80 it becomes more difficult to attack. The rule of thumb in the computer business is to only open ports that have activity on them. So if your purpose were to host web sites you would open port 80 and close all other ports. Of all the billions of computers contacting your computer, all traffic except on port 80 would be ignored. It would not be allowed to get through. I like to think of the computer as a ball. In that ball is one hole. That hole is a pinprick. It is one tiny hole. If the traffic doesn't hit that hole it bounces off. It is ignored. The analogy of a computer with one port open, surrounded by billions of connecting computers is a good one for awareness. Awareness is firewalled. At any given moment we have a deluge of information coming at us. Awareness will accept information through one port only. The vast majority of the information coming at us is blocked. It is ignored. Nowhere is information blocking more evident than with time. Awareness will only allow the present moment to get through. All other moments are blocked. We know from dreams that our awareness need not be in the present all the time. During dreams we often dwell in the mind's virtual reality, not in the present moment. That means there is an alternative to the present. Dreams bare this out. Our firewall keeps awareness restricted to one moment only. Just like the computer being open on port 80 only, the mind is open to the present only. If we were to remove the mind's firewall multiple moment could get through simultaneously. Think of the firewall as holding back these additional moments. What this means is that awareness is poised to explode at any time. It is only the firewall that keeps that from happening. We can be thankful that our mind's firewall keeps awareness restricted to a single port. If the firewall malfunctioned and opened a second port, the result would be a mishmash of confusion. Our firewall restricting awareness to one moment in time and one location in space keeps us functioning normally. At the end of life the firewall goes down. Awareness is no longer restricted. It is free to expand in time. It is free to expand in space. What you have by the firewall going down is an expansion of awareness from a single location in time-space to all time-space. All time-space is memory. We will never experience this during life. During life we are confined to a location within time and space. In afterlife this turns inside out. In afterlife we become all time and space. As such we become all seeing and knowing. Through death each one of us becomes God.